ReSurge’s programs are delivered primarily by volunteer medical professionals who donate their time and expertise to train their developing-world colleagues and provide reconstructive plastic surgical care to the poor in the countries we serve. We also benefit from donations of medical supplies from a range of health care corporations. Thanks to the generosity of our volunteers and in-kind donors, per our audit, approximately 85% of our budget goes directly to medical programs that change lives. Charity Navigator Ratings: ReSurge believes Charity Navigator’s star ranking of nonprofit organizations tells only part of the story. 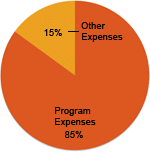 Charity Navigator’s methodology measures only cash donations in determining how efficiently an organization is run. Because approximately half of ReSurge’s revenue is from medical services donated by our volunteer medical professionals and medical supplies donated from a range of health care corporations, our Charity Navigator efficiency rating does not accurately illustrate our effectiveness.